Monnow Gate and Bridge01600 775257work Historic SiteMonnow Bridge in Monmouth, Wales, is the only remaining mediaeval fortified river bridge in Great Britain with its gate tower still standing in place. Originally built with a portcullis, it's primary use was for defence, but over the years it developed into a toll collection point,, a jail and even a home! 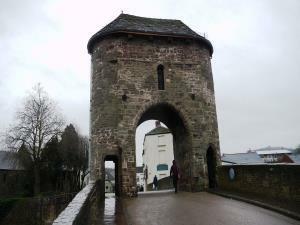 Monnow Bridge in Monmouth, Wales, is the only remaining mediaeval fortified river bridge in Great Britain with its gate tower still standing in place. Tours are available of the gatehouse above the bridge. Please contact Monmouth Shire Hall for more details.